One of the more challenging things for newbie preservers to grasp is the use of pectin in jam and jelly recipes. Too much, and you turn your jam into jellydrops. Too little, and you’ve got a syrup. (No problem, just bust out the pancakes!) 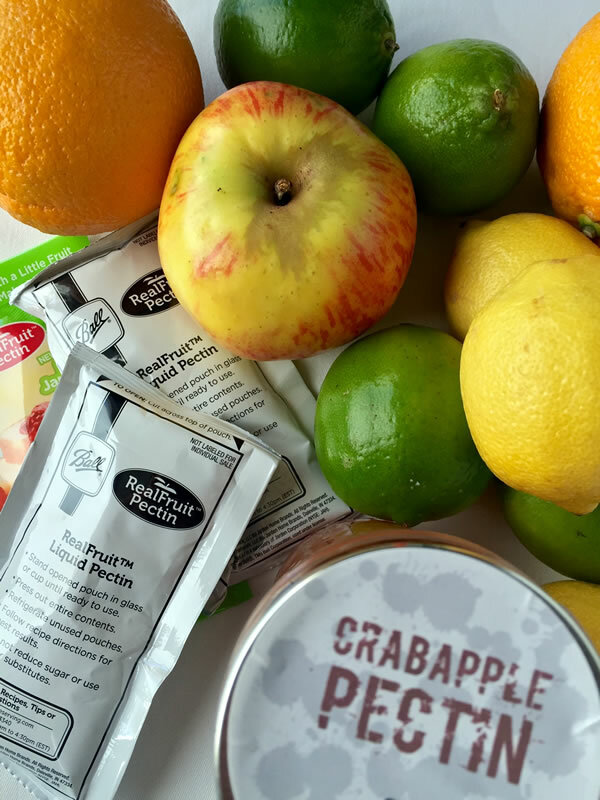 Commercial pectin comes in dry and liquid forms, for recipes with high or low sugar, and there’s even Pomona’s Pectin, which reacts with a calcium solution rather than sugar to create a set. And many of us tend not to add pectin at all, if it can be avoided, using a technique called maceration. 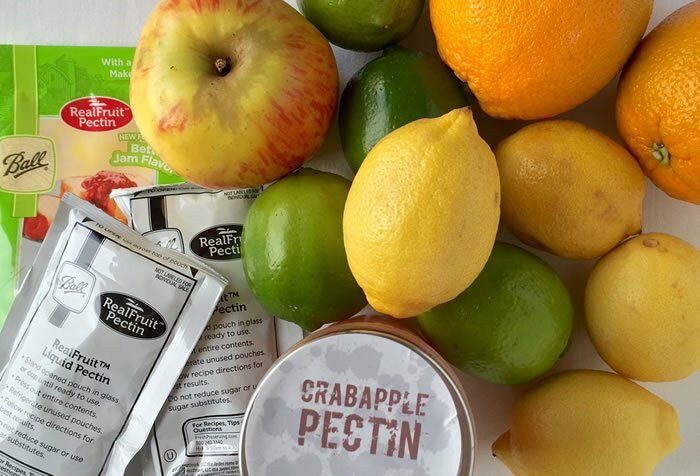 So what is pectin, anyway? Pectin is a naturally occurring starch—technically a heteropolysaccharide (gesundheit! )—that exists in the cell walls of fruits and vegetables and gives them structure. Fruits that are naturally high in pectin, like apples, are firmer, whereas softer fruits, like a ripe tomato, are lower in pectin. Marisa of Food in Jars says to think of it in terms of a “splat test”—if you drop it from 12” and it bounces, it’s higher in pectin. If it goes splat, like a ripe strawberry, it is low in pectin. When added to jams, in combination with sugar and acid and brought to a temperature of 220ºF, pectin forms a matrix. This is responsible for the “set” in jams and jellies. Commercial pectin is in fact derived from natural sources, usually apples or citrus rinds. However, they’re pretty opaque about how it’s made, so we cannot know if they pass the Unprocessed sniff test. Fortunately, you can make your own DIY pectin easily at home, with no special equipment. This can be done with any high-pectin fruit. Like the commercial producers, you can use citrus rind or apples. 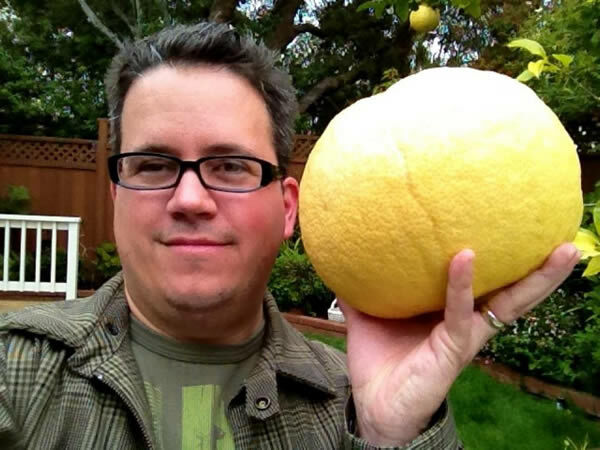 The first time I made pectin, it was with a pomelo I picked that was bigger than my head. Pomelos are almost totally rind, with little flesh, so they make a great candidate for pectin. Trim away the zest (and feel free to use that to make limoncello, or rather pomelocello) and the flesh in the interior. Cut the rind into 1/2″ cubes. Lay it into a wide, shallow pan and add just enough water to cover, plus 1/4 cup lemon juice. Bring to a hard boil, then reduce heat and simmer for 15 minutes. Remove from heat, allow to cool, and strain out the pectin stock through a jelly bag or several layers of cheesecloth. Let it drain naturally; squeezing will make your pectin cloudy. If you don’t have access to pomelo, you can use any citrus. For citrus fruits that have more flesh to them, be sure to save the seeds and membranes, which are exceedingly high in pectin, and use them for this as well. This is why marmalade has a firm set. This same method works for unripe apples, and especially crabapples. Use the entire fruit; the skins, cores and seeds are where the most pectin is. You can also use just the skins and cores of regular apples. (Feel free to save the skins and cores in a bag in the freezer, and then make up a batch with just those when you reach critical mass.) When a friend brought me bags full of crabapples from her tree last year, I used the green ones to make pectin stock and the red ones to make jelly. Your homemade pectin stock can be frozen, or even water-bath canned, hot-packed, for 10 minutes. It will keep for at least a year. As for how much to use, well, this is where things get squishy. Homemade pectin stock will not be as precise as powdered, so you may need to do some experimentation. I find that, generally speaking, 1/2 cup of the pectin stock is roughly equivalent to about 1 tablespoon of dry pectin, but that it also has a softer set, which I prefer. That’s as much as I used in a recent batch of tomato jam, which needed a little extra help in the set department. It did just the trick. Thank you for the article. I was glad to see how you use it (“dosage”), because making pectin has never been an issue for me, but the use of it for jelly making has. I really want to avoid re-jellying. I like being self-sufficient, but having consistency is pretty important to be efficient with my time. Yeah, I probably wouldn’t use homemade pectin for jelly, but I do like the soft set it gives in jams. Sometimes I’ll also just throw in some slices of lemon or orange to help bump up a set. Down here in NZ it is common to use lemon juice as a setting agent in jams, jellies and other preserves – I have never used commercial pectin always use lemon or lime which grow very well here in Hawke’s Bay. Love your comment suggestion/advice re: throwing in some slices of lemon or orange for insurance. I linked to the tomato jam recipe on about.com–looks like that is going well. Cheers! Thanks, Letty! I’m having lots of fun with the About.com gig. Hope you’re doing well! I’ve been having plenty of fun with the About.com gig. Hope you’re well, Letty! Some people do take pectin as a supplement, and there is some apparent evidence that it is effective in fighting high cholesterol. Thanks so much for your article. I now know so much more about pectin.